These aluminum cartridges store the life-blood of the Mammut Airbag system: simple compressed air. The cartridges can be purchased with or without a charge, noting there are transport restrictions on a charged unit (no air travel). 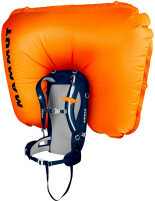 Either one can be refilled using a compressed air source such as a SCUBA or paintball tank. To recharge a unit, you’ll need a tank, adapter, and a refill kit that consists of a disposable gasket and cover plate. The cartridges are designed to hold 3000 PSI and weigh 625g empty or 700g with a charge. Integrated pressure gauge helps control the fill. Comes with 3 refill kits, with more available. Filled cartridge may not be air-shipped. * Please note these cartridges are compatible with 2.0 and 3.0 Mammut/Snowpulse systems, but not the original 1.0 version. The mammut canister feels solid in hand and so far has held its charge well. New versions with the protective cover seem have some visual confidence built-in, and canisters are just low enough pressure to be filled by many shops (including Paintball shops in far flung parts of the world). 3000 PSI seems to be the new standard (ala new BCA floats), and now just wishing Mammut could get the carbon versions into the states.